'If knowledge is a generic approach or system of navigation corresponding to schemata of the Universe, then we can recognize speculative thought as a particular navigational scheme corresponding to schemata of a Universe that explicitly express its contingency, bottomless continuity, invisible layers and alternative passages or conceive the meaninglessness of the free sign, the unbound modality of the eternal and the in-divisibility of 0 qua nothing of nature for thought' (Leper Creativity, 290). It is here that we see speculation bind the aesthetic, philosophic and scientific modes of enquiry. 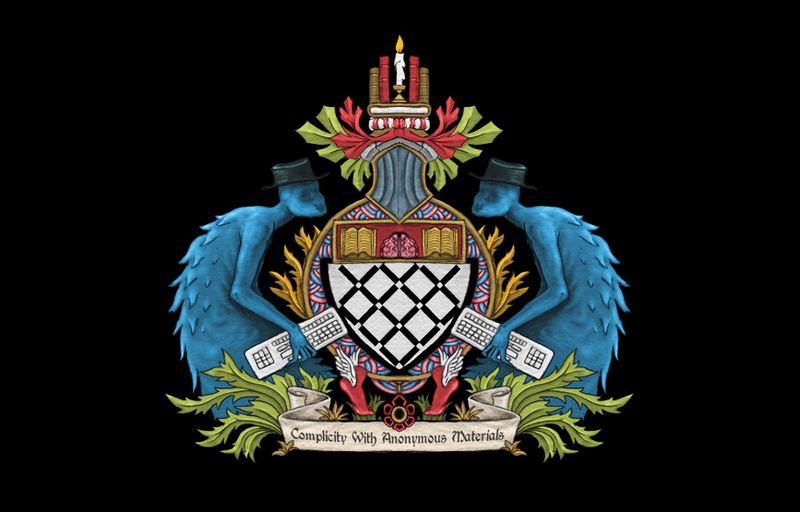 This speculative task involves understanding how concepts or identities co-create the real, but also the originary decision that provides this creation. In my paper here I am going to try and show how Francois Laruelle’s non-philosophy might be manipulated into fulfilling this task: I believe that Laruelle's non-standard aesthetics helps us navigate the speculative nature of the artwork, as well as suggesting a form of writing or theoretical praxis that might align itself with this. '[...] the non-thetic immanence of what Laruelle calls "the One" or "the Real" becomes an index of radically singular but non-consistent Identity, an identity shorn of the presumption of ontological unity. And it is this suspension of thetic positing, of intentional correlation and transitivity, which the 'non' in 'non-thetic immanence' imparts to thought insofar as it begins to think … on the basis of radical immanence as its real, yet non-ontological presupposition' (ibid, 70). What Laruelle provides, here, is a formulation of transcendental immanence without content, that effectively allows us to think originary decisions in philosophy as a multiplicity, providing a kind of eclecticism of philosophy; no one system is right but provides a different decision on the constitution of the world (this is an amphibolous existence for philosophy). The phenomenological world is thus an 'empirical occasion' which presents a different world to the one we are perhaps used to seeing: 'a bunny rabbit has exactly the same phenomenal status as an axiom of set theory, and a particle accelerator has exactly the same phenomenal status as a toothache' (Brassier 71). Laruelle wants to provide a science of this One, but how does one provide a science of the original particle of philosophy – the first decision – without lapsing into decision itself? How does one, to riff on Brassier, provide an account of the non-rabbit, when there seems to be an immediate lapse into a form of rabbithood, a concept of the rabbit? I believe that art – including and especially literature – allows us to ‘behold the non-rabbit’, it provides a non conceptual instantiation of matter, of object, and the way to a mode of speaking or writing about art is to follow this route of 'non' so as to encounter and not diminish or do away with the non-conceptual truth that art presents us with, an aesthetics adequate to artwork in its specificity, its singularity, as artwork. The aesthetic presents a rabbit with form but without concept. It is a composition of a rabbit, created through pixels, brush strokes, compositional technique, reconstitution and recognition. I would like to develop a speculative aesthetics that does not simply revolve around the contingency that inheres in either the artwork itself or the artwork viewer relationship or any supposed fetishisation of the unintentional, incidental or environmental accessories to the artwork, but one that also relies on the formal mechanics of the artwork themselves to suspend Decision. 'objectivity so radical that it is perhaps no longer an alienation; so horizontal that it loses all intentionality; this thought so blind that it sees perfectly clearly in itself; this semblance so extended that it is no longer an imitation, a tracing, an emanation, a "representation" of what is photographed' (Laruelle, quoted in Alexander Galloway, Laruelle and Art). The distinction between Laruelle's non-standard aesthetics and the philosophy of Deleuze and Guattari, for instance, is that art is, like science or philosophy, a theoretical praxis and not a distinct mode that works, for instance, in affects or percepts but in fact thinks through perception rather than hypostatising it. In an essay on Laruelle and aesthetics, Alexander Galloway draws out perhaps the most important impact that Laruelle can have on our understanding of and approach to art: art can co-create the real, but equally, art reveals a non-decisional real, a real subtracted from the one governed by the One, and this binds philosophy and art together. Galloway writes: 'For Laruelle aesthetics involves a convoluted interaction between art that asks to be contemplated and contemplation that seeks its art. Art and philosophy co-constitute each other in terms of lack, for each completes the other' (ibid). Galloway notes that the object of art can equally be 'perception itself' (ibid). The idea of perception as an object itself is in some senses the first mode by which art can become speculative: perception looks at itself. Art can make one see aspects that we consider to constitute perception: including time, space, and light. Art can make us see - can produce - what in a Kantian framework what would have been taken as transcendental conditions of perception: time and space. Galloway’s gloss on this is particularly pertinent: 'Systems of representation reveal aspects of the world to perceiving subjects; this is how [for instance] light makes manifest. But is it possible to see light in itself, not in relation to a perceived object? Is it possible to manifest the rigorously immanent genericness of light itself?” (ibid). Equally, the question of whether one can be made to 'see space' seems almost senseless, by virtue of the long history of space and time as conditioning factors of perception, a history overthrown both by 20th century physics and by speculative thought that presumes that we can know the conditions of perception, that is, get outside the phenomenal. Laruelle's formulation of 'Occidental orientation' describes the mode in which artworks do exceed or move outside of the equation between being and perception. Non-standard aesthetics looks at the creation of new objects as well as providing a kind of alien version of the objects we think we know which allows a reconstitution of perception. The example that I am going to briefly deal with is British artist Cornelia Parker's 2004 installation work entitled Heart of Darkness. 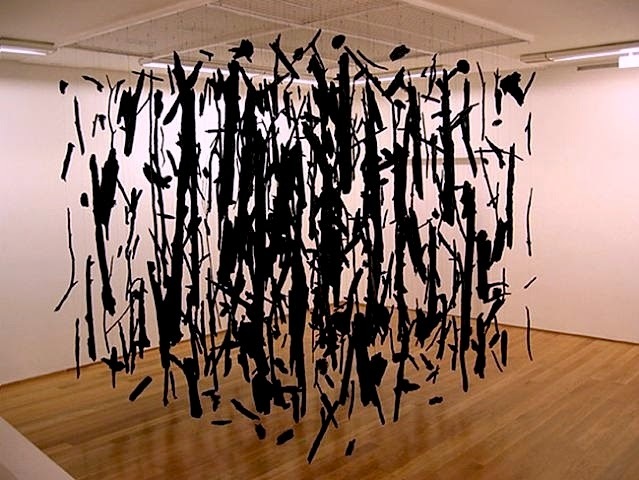 This artwork involves charred remnants of a forest fire hung in a cube shape within the gallery, and resembles very closely other artworks of Parker's, especially her most well known work – the resurrection of an exploded shed entitled Cold Dark Matter. The forest fire was initially an event of controlled burning done by the Florida Forestry Division, but the fire became out of control, and became destructive. Neither the sense of chaos nor the provenance of this work is immediately evident from the simple form: the cuboid three dimensional snap short of the charred wood creates a disjunction between the geometry of the frame and organic inconsistency of the charred wood. Simultaneously the destroyed trees are taken back to their original, vertical existence, raised from the dead, so to speak – in this sense a temporal and immortal existence is created by this composition. The artwork presents multiple compositions whereby one object relates to another object, or alters other objects. This artwork creates time, stages isolation, and above all thinks through visibility. Heart of Darkness and Cold Dark Matter present moments that are unseen, which do not lapse into moments seen – this is a curious statement and I'll explain what I mean. Heart of Darkness presents the distance between the tree and its destruction, just as exploded shed presents a moment that we cannot perceive – the instant of explosion rendered static: the force and temporality of the explosion, which would normally condition experience, removed. Here we have an object that is unrevealed in its presentation, or, on the other hand, presents something unrevealed. Parker's work presents an in-visible object: the detritus of the fire partially restored, the explosion of a shed reconstituted without its force. The wood in both contexts – from the trees and from the shed - is not oriented towards a world, but is immanent to itself. It becomes linear, in this room it becomes an interaction called monochrome, it becomes two dimensional and three dimensional depending on how you look at it. The object is not exhausted by decision, it is open to speculative existences. Each of these artworks are also explosive occurrences that become several other identities – there are several thetic ways of taking this, yet the object itself presents no necessary decision and does, even, resist thetic attribution precisely in its own conceptualisation – in the title Heart of Darkness. This artwork subtracts again and again from the decisions we make about it. The allusion to Joseph Conrad’s Heart of Darkness is not necessarily an allusion to a narrative, even though we are perhaps preoccupied with the destruction of wilderness and this is a suggestive link. Rather, Conrad's Heart of Darkness was published in Blackwood's Magazine, later the novel was published by William Blackwood. The reference is a relation between one composition – Parker's installation – and another composition – the process of publishing Conrad's work and the network associated with this. This compositional format suggests yet another composition, which involves the insertion of wood into the marketplace. Wood is particularly interesting in terms of its commodity form – we can think of Marx's famous image of the table, which 'stands on its head, and evolves out of its wooden brain grotesque ideas'. This is a wonderful non-decisional moment in Marx's Capital and affirms yet again the simple distinction at the heart of this speculative work that we need to pay fidelity to: this artwork starts to think perception, rather than thinking through perception. Like photography, Parker's installation is a 'thinking instigated by the artificial simulation of perception' (Mullarkey, 151), a non-ontic and perpetually speculative piece of art, and read in Laruelle’s terms opens up a form of art-writing or criticism that is itself speculative, which might follow the various lines of black wood, the hearts of darkness, or the cold dark matter, open to it.